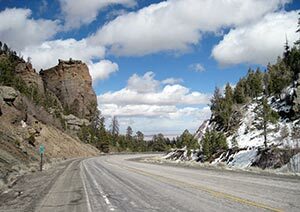 At 9,000 feet, Narbona Pass is one of the highest points on the Navajo Nation and one of only two paved passes over the Chuska Mountains. It was known as Washington Pass after Col. John M. Washington, whose troops killed the respected chief Narbona here, until the early 1990s, when a group of Navajo Community College students persuaded the U.S. Board of Geographic Names to change it. BOTTOM: This little convenience store is the only business in Sheep Springs, although there is a thriving flea market on the weekends. Vendor stalls at the new welcome center will provide comfortable spaces for crafters to sell their wares. In decades past, you could go to Sheep Springs this time of year and find nobody there. They would have already started their annual trek up the Chuskas, driving their sheep and goats to their spring and summer pastures. "Everybody had a house up high in the mountains," recalled Clara Garc’a, Sheep Springs' postmistress. "It was like a big old family reunion. Your grandmother would say, 'Go out there and butcher a couple of those sheep so we can feed all these people.'" These days, says Sheep Springs Chapter Vice President Louise Charley, few families make the trek, and if they do, it's mostly out of nostalgia. She blames technology. "The younger generation doesn't want to go anywhere they don't have TV, Internet and cell phone reception," she declared. It's also because of the drought, added Chapter President Ernest Smith. Here were once some of the most lucrative ranches on the reservation, but the little ponds have dried up and you have to drive your flocks higher up on the mountain every year to find good grass. The chapter's ranchers' association is trying to revive the industry with an irrigation project and reservoir in the works, but most people have already given up and taken jobs in Gallup, Shiprock or Window Rock, all of which are at least 40 miles away. "We're right in the middle," Garc’a said. She herself lived in Phoenix for years, but got homesick for the quiet and the spectacular sunsets over the Chuskas. She's underemployed; she has training both as a pharmacy technician and a machinist's helper, but she doesn't mind. "I don't have to put miles on my car every day, and buy all that gas," she said. "And this is a fun job. You see everybody." Like Charley, Smith and Garc’a, most of the people here are at least middle-aged. You hardly see a child. The young families have fled to the city, leaving the chapter with a large population of elderly to care for. They're doing a good job. The senior citizens center is a hot spot in town, with elders busily quilting and working on crafts, which they sell to buy more materials. If the seniors seem exceptionally talented, it's because Sheep Springs has a long history of crafting goods to sell. Back when the trading post was operating, it was famous for its rugs: Two Grey Hills-style, but done in the natural greys, browns, blacks and whites of undyed wool. You can see some fine examples at the chapter house. Garc’a remembers those days, when the convenience store that now houses the post office was the Sheep Springs Trading Post. "I can still smell the wood, the leather, the coffee on the stove," she said. "If we had a handful of pennies, we thought we were rich. We could buy a whole bunch of candy. Sheep Springs still has a thriving flea market on the weekends. In an effort to promote the crafts and also the chapter's central location to Shiprock, Chaco, Canyon de Chelly and other tourist attractions, the Navajo Nation Tourism Department recently opened a welcome center with 12 booths for craft vendors and two kitchens at the intersection of U.S. Highway 491 and New Mexico Highway 134 (the Narbona Pass road). On the sunny Friday afternoon the Times visited the center, there were no visitors there and just one vendor selling tamales out of a van. Part of the problem could be there's no sign identifying the center, and it's hard to figure out what it is just looking at it from the highway, especially with no one manning the booths. The tourism department plans to erect several signs before tourist season, according to Smith. Inside, the hogan-shaped welcome center is spacious and inviting, with a rack of brochures and a friendly woman manning the counter. But she commutes from Gallup, and confessed that when a tourist from California asked her where she could buy a rug in Sheep Springs, she didn't know what to tell her. The main problem with the new market, said Garc’a, is that it's closed on weekends, when most people like to sell. To add insult to injury, it's surrounded by a chain-link fence that is posted "No vending." "The vendors come in here and say, 'What's the fine for selling? Can I just pay it now and get it over with?'" she said. "I tell them, 'I don't think there's a fine. Go ahead and sell; the worst they can do is drive you off.' But so far no one has chased them away." Name -- According to local elder Alice Yazzie, Sheep Springs was given its name by an early trader. The Navajos knew the area either as Too' Haltsooii (Verdant Springs) or To' Litsoii (Yellow Springs) for a spring that bubbled out of golden sand. Major clans -- Kinyaa'áanii, Kinlich’inii, Honaghaanii. "My grandmother used to say, 'Don't marry anyone between Naschitti and Littlewater,'" recalled Postmistress Clara Garc’a, "We're all related.' That's why I came home with a Spanish man." Claim to fame -- Some wonderful sandpainters and rug weavers came from here. Garc’a's great-great-grandfather, Hastiin Peshlakai, was a well-known silversmith who is featured in several early photographs of Navajos. History -- The 9,000-foot pass between two rock faces that forms the boundary between Sheep Springs and Crystal chapters has been the scene of both fortune and disaster for the Diné. In 1835, they successfully ambushed Mexican raiders as they rode between the rocks, but in 1849 the tables turned when the respected headman Narbona was gunned down at the same site by Col. John M. Washington's troops during what were supposed to be peace talks. The Americans named the pass after Washington, an insult that was not corrected until 1992, when a delegation of Navajo Community College students successfully petitioned the U.S. Board of Geographic Names to change the name to Narbona Pass. Today it is the site of the Narbona Pass Classic, a popular but grueling 10K race. Sheep Springs was also briefly the site of the Navajo Indian Agency during Henry Dodge's tenure. Some say he moved the agency from Fort Defiance because he was secretly married to a Navajo woman here. Assets -- Chuska Mountains, new visitors' center and market at the intersection of U.S. 491 and New Mexico 134. Upcoming projects -- a new multi-purpose building was recently funded by New Mexico's Tribal Infrastructure Fund. It will have a gym and basketball court in addition to a chapter meeting room and offices. Smith and Charley hope the center attracts some other business to the busy intersection. 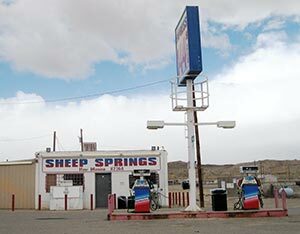 Sheep Springs is a certified chapter, which means it can pass an ordinance to collect taxes, but so far the convenience store is the only business. Like most of the chapters along U.S. 491, however, Sheep Springs is hamstrung by its archaeology. The Navajo are not the first people to discover this flood plain watered by little springs at the foot of one of only two good passes over the Chuskas. "The whole community is built on top of an Anasazi village," said Garc’a. "Ask anybody here. They can tell you some stories, if you can get them to talk about it." Here's Garc’a's Anasazi story. When she and her kids first moved into their house, the kids kept complaining about "the lady" who hung around the back rooms. "Mom, she's there again!" they would say. "She's just looking at us." Garc’a would walk back with them and say, "See? There's no one here." One time she thought to mention it to her mother. "She said, 'Oh, that's just an Anasazi. They're all over the place out here. Just greet her nicely and walk past her. She won't bother you.'" That sort of depends on your definition of "bother." The family has learned to live with not only the ghost but unexplained crashing sounds and disappearing objects. One time, Garc’a said, she left the cordless handset of her telephone on the armrest of the couch and it disappeared -- only to reappear in the exact same spot six years later. "Now when we lose something, we just say, 'The house ate it,'" she laughed. If it could stir up a market for ghost stories and nostalgia, Sheep Springs might just be the richest chapter on the rez. Until then, it's waiting for tourist season to start and hoping Tourism gets its act together in the meantime.